Dodgy At Best: Go NAYV! 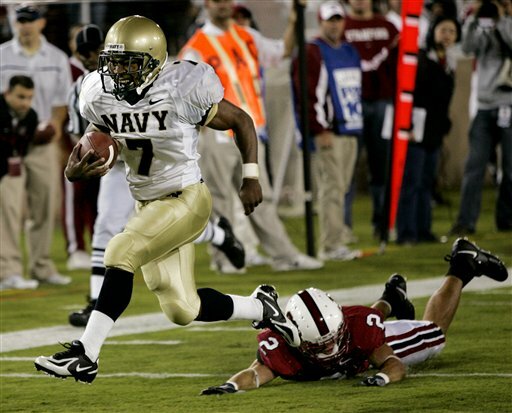 So Saturday night after almost all of the dust from a great day of college football had settled, I found myself watching the humiliation of Stanford at the hands of Navy. The game sucked and was a boring blowout, but when you have a bet on Navy at +1 and they are up by 4 touchdowns (and it is the last game on TV) you mindlessly watch the beauty of a comfortable cover. I was enjoying the game that was making me 5-2 for the day after an 0-2 start when something pretty epic caught my eye. Navy are one of a handful of teams that have the team name on the front of their uniforms - so each dude has "NAVY" in big block letters above their uniform number. Everyone except the backup kicker who comes on to kick a field goal in the last 2 minutes of a massive blowout, that is. Dude's jersey sais "NAYV", with his number 90 below. This is epic on many levels. but not the awesomeness of #90's jersey. 1. How did the typo come to be? Did team sponsor Nike just screw up on this one jersey? And if so, how did it get past the Navy equipment manager and coaching staff all the way to week 3? Remember we are talking about the United States Naval Academy, where rules, regulations and other tedium are in a word... strict. You do pushups and KP for having a scuff mark on your shoes - hard to imagine that Nike shipped a jersey with the name of the school (and an entire armed force for that matter) spelled wrong and it went unnoticed/tolerated for 3 weeks. 2. After contemplating #1 for a minute on Saturday night, it struck me just how epic the typo was: NAYV is phonetically the same as NAVY; read it or say it aloud and it sounds identical. This is where my mind started to churn. 3. Did the kicker un-sew (de-sew?) the letters and sew them back as NAYV to be a smartass? Did he do this at the beginning of the year and it has been this way for 3 weeks? Or, knowing the huge reputation of the smartass, irreverent Stanford band, did he do this bit of irreverent smartassness in honor of the occasion of playing Stanford at Stanford on a night when said Stanford band was suspended (yet again) for seriously vandalizaing their band shack? Was he in the hotel room with needle & thread on Friday night saying "these fools think they are funny, irreverent smartasses? I'll show them funny, irreverent smartass..."
What I know is that it is funny as hell. What I wish I knew was the backstory/explanation. I can only hope that Matthew Harmon goes on to one day become POTUS or some high fallutin' politician and writes a book where this is revealed as some seemingly insignificant background detail of his college days.